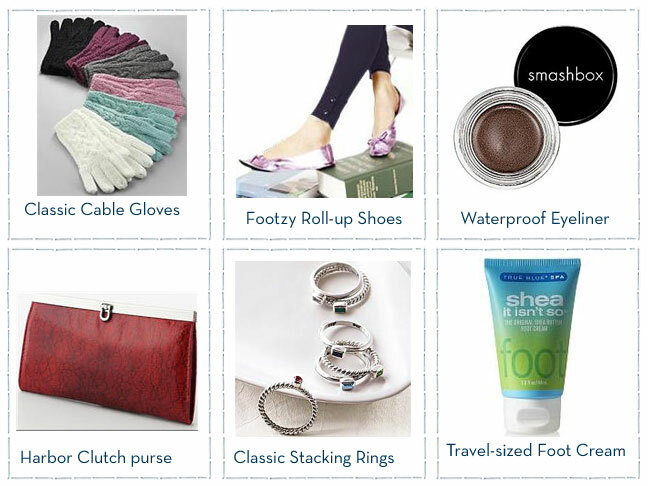 If you’re looking for some fun and stylish ideas for Stocking Stuffers this year, then check out these ideas that won’t cost you a fortune, in fact all of these ideas are under $20! 1. Warm and cozy cable gloves are the perfect accessory for helping stay warm this winterand you can grab them for just $9.95 at New York and Company. 2. These classic ballet slippers roll up so that you can tuck away in your purse and come in several different styles and colors. Prices start at just $19.99. 3. Great waterproof eyeliner is perfect for creating a dramatic evening look. This is a Sephora exclusive and right now it’s marked down from $22 to just $5. 4. This beautiful red clutch is also available in Black, Red, and Purple and features a Floral Lace Pattern. This small accessory would make a great gift or stocking stuffer. Available at Kohls.com or at Kohl’s stores for arond $19. 6. Convenient travel-sized foot cream from Bath and Body Works is one of my favorite products to use during the winter months and is priced at around $6 each or you can buy 3 for $10 for an even better deal!